Mr. Chancellor, Mary Simon has devoted her life’s work to advancing Inuit rights and culture in Canada, and to achieving social justice for Inuit and other Aboriginal peoples at home and abroad. Born in Nunavik, she began her remarkable career in public service with the Northern Quebec Inuit Association, an organization dedicated to supporting Inuit rights and interests in Nunavik, including during negotiations of Canada’s first comprehensive lands claim agreement in 1975. She was subsequently elected as the association’s president, and played a leadership role in the implementation of the historical James Bay and Northern Quebec Agreements. She was also one of the Senior Inuit negotiators during the repatriation of the Canadian Constitution, during First Minister meetings from 1982 to 1992, as well as during the 1992 Charlottetown Accord discussions. In 1994 Ms. Simon was appointed to be the first Canadian Ambassador for Circumpolar Affairs, and took the lead role in negotiating the creation of an eight-nation Arctic Council. She also served as Canada’s Ambassador to Denmark. She is the founding Chair of the Arctic Children and Youth Foundation and a founding member of Canadians for a New Partnership, an organization of distinguished Canadians working to rebuild the relationship between the Indigenous Peoples of Canada and Canadians. Her achievements and contributions have been well recognized. She is an Officer of the Order of Canada, a recipient of the National Order of Quebec, the Gold Order of Greenland, the National Aboriginal Achievement Award, the Symons Medal and the Governor General’s Northern Award. Ms. Simon is also a member-inductee of the International Women’s Hall of Fame, a Fellow of the Arctic Institute of North America, and was recently honoured by the Public Policy Forum for her contributions to public life, public policy and governance in Canada. 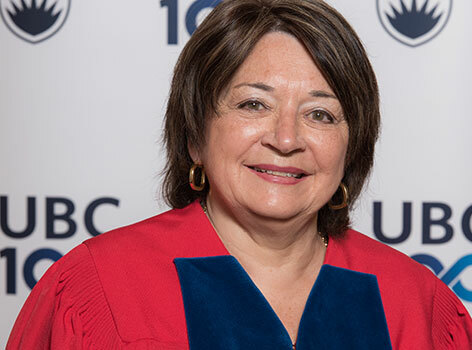 Mr. Chancellor, in recognition of her life’s work to advance critical social, economic and human rights issues for Canadian Inuit and Aboriginal peoples internationally, I ask you to confer the degree Doctor of Laws, honoris causa, upon Mary May Simon.